Positive touch and holding are wonderful tools for you to use in the first few weeks of your baby’s life as you get to know your newborn. Gentle soothing Baby Massage can offer you a way to relax together, relieve pain such as tummy discomfort and teething, and help improve sleep. Massage can be made fun with the introduction of songs and nursery rhymes as your baby gets older, ( and I find it great way to soothe when my little boy complains of ‘growing pains’). Pure natural organic skincare to use on baby’s delicate soft skin for baby massage for regular massage. One of the wonderful benefits of massaging your baby or child is that you create a special time out of your busy day, to spend together which can greatly strengthen your bond. Part of that bonding process is smell and this light blend of Lavender and refreshing Mandarin for both mum’s skin and baby’s, is perfect to calm and relax you both. 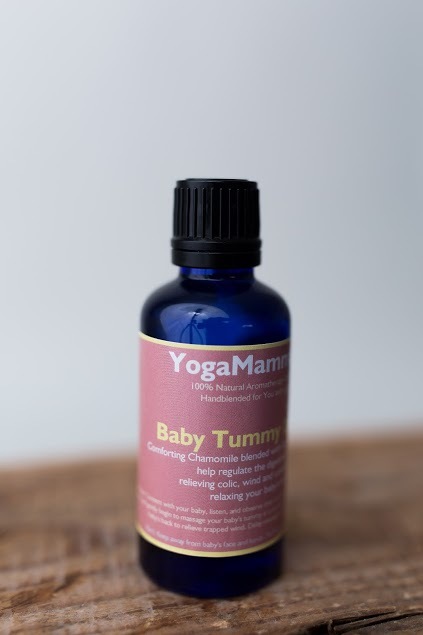 Comforting Chamomile is chosen to help regulate the digestive system, relieving colic, wind and constipation while relaxing your baby’s tummy. To Use: Massage your baby’s tummy in a clock-wise direction as this is the direction in which contents of the bowel move. Tummy massage can be practiced three to four times a day. Try not massage when your baby is either too hungry or too full. Listen to your baby and read their cues. Unique handmade gift for both mother and baby. Great idea for a baby shower and new baby gift. Safety: It is recommended to do a patch test before using any of the blends. If you are on medication please consult your doctor. Oils are for external use only. As there are no added preservatives, and each blend is made to order, use within two months and store in a cool, dark space. Please note some oils are derived from nuts. The information in this leaflet is intended as guidance only and is not intended as a substitute for medical advice.